Put on your walking shoes and get thirsty for history in anticipation of the next installment of the Bushwick Brewery Tour on October 22. 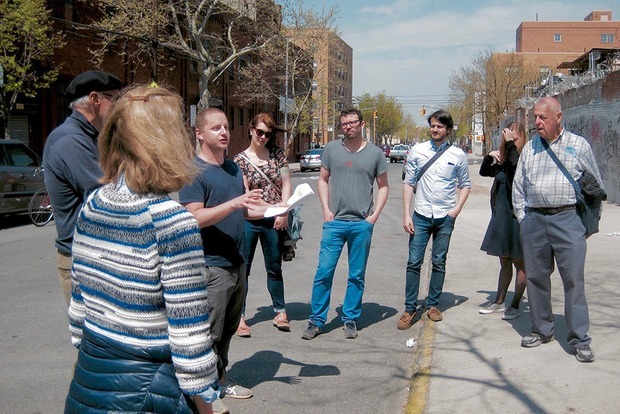 Tour guide Chris Heuberger will show you the hidden past of the giant, old buildings dotting Bushwick and East Williamsburg. Stops on the tour include the Claus-Lipsius Brewing Company at 493 Bushwick Ave. and William Ulmer Brewery at 81 Beaver St. Those two breweries represent only a small fraction of beer-making activity in Bushwick at the height of the Industrial Revolution. Heuberger recalls getting unexpected access with his tour to the private home of the person who lives in the old William Ulmer office. He says, "There was an amazing decorative motif painted on the ceiling [of the dining room] incorporating hops and the whole mood of the house evoked such a sense of old money and grandeur from the late 19th century, when this brewer was one of the most powerful men in the neighborhood." Of course, this isn't just a plain history lesson. At the end of the experience, tour participants will "end at a bar and enjoy a pint in the tradition of Bushwick’s once and future glory!" The bar, of course, is The Well- the East Williamsburg space itself was a former brewery, too. Future glory is correct! Just this past week KCBC's new space entered into soft opening mode, and who knows what else the next few years will bring. Heuberger adds, "People around the country are doing remarkable things with beer and I think Bushwick, with its historical background and growing creative culture, deserves a place among the great beer capitals. It needs to renew its beer reputation." Tickets are $30, which includes a free beer at The Well, and there are no definitive plans for a tour following this one, so jump on it while you have a chance. Featured image: tour guide Chris Heuberger educates a tour group. Photo courtesy of Bushwick Brewery Tour.